The following is a list of the alternate routes that I took when yo-yoing the Continental Divide Trail in 2007. I've included some simple alternates that are pretty short and clearly described on Jonathan Ley's maps, but I've paid the most attention to the routes where it felt like I was leaving the beaten path. 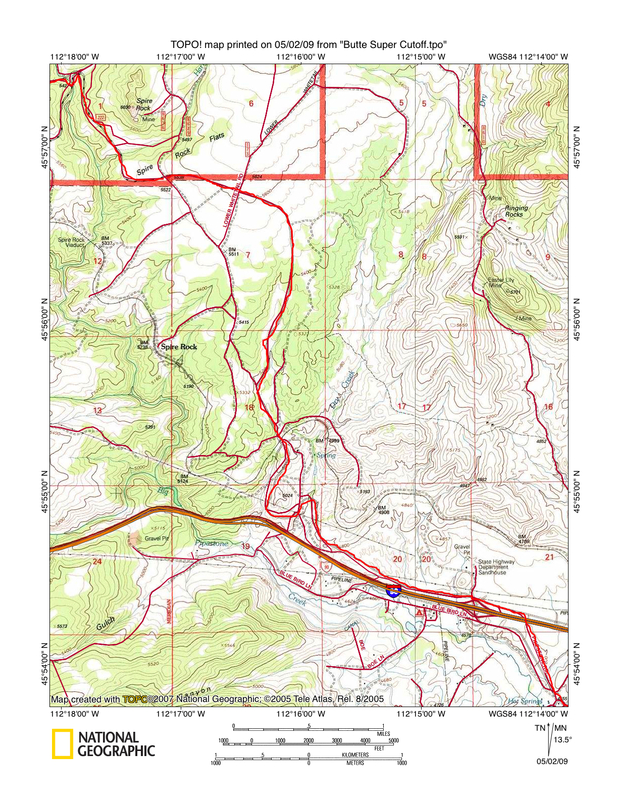 Most of the simpler ones can be done with just the standard stuff--Jonathan Ley maps, DeLorme maps, and the CDTS guidebooks, but some require a few Forest Service or TI maps, all of which I picked up without too much trouble in towns along the trail. The longest alternate, what I call "the Butte Super Cutoff" requires a handful of extra maps, and I hope to eventually do my own Ley-like topo-mapping of the route in case anyone wants to do anything similar. I really enjoyed making up my own routes on the CDT, so I'm providing this information as a source to help others do the same. I don't think this information will be very interesting to many people, and it will be almost meaningless without a good set of CDT maps or a ridiculously good knowledge of the trail in certain areas, but Montana, where I did big alternates in Glacier, the Bob, and from Butte to Yellowstone, might be a little less less-interesting. I found that I was much more happy with bushwhacking, rough climbs, and cross-country hiking when I chose to inflict these things on myself; when Jonathan Ley or Jim Wolf inflicted this on me, I usually got pretty upset. So I would advise against doing many of these alternates in the exact same way I did them, just use them as a second or third opinion and hike your own hike. Information is organized in a northbound fashion, with relevant 2007 Ley map numbers. NM 43--Got lost and trespassed on the very first day in the Tres Hermanes section, so I decided against the Florida Mountains route, walked HWY 11 north to what is Espejo Ave. on NM DeLorme 53, walked that (mostly dirt) road all the way to Deming. NM 30l--Went down Water Canyon instead of McKnight Canyon to get to HWY 35. There is no water in Water Canyon. NM 40--Tried to avoid private property by cutting east and going around the north side of "the Saltys" instead of continuing south on the more westerly route. NM 34-37--Sobo I walked HWY 15 from the Cliff Dwelling VC to Silver City. Nobo I did the main stem of the Gila, but there really isn't much in the way of trail south of Doc Campbell's, so I didn't feel like doing it again. NM 34--Nobo I took the alternate from the Cliff Dwellings. Nice views when you top out before dropping down into the Middle Fork. Sobo I stayed on the Middle Fork all the way from Snow Lake to the VC. No regrets either way. NM 29--Did the Govina Canyon route both ways. Good decision. NM 25--Took the purple route (Wild Horse Canyon Road). It was straightforward, but I thought I was somewhere else on the map. So I ended up missing Bonine Canyon, going by Cedar Windmill (off), and meeting the trail in Armijo Canyon. Terrain not going to be great no matter what you do here. NM 23--Took the rim trail Nobo, walked the road Sobo. Honestly, I think walking the road below the sheer cliffs was more interesting. NM 22-20, 20a--Did Bonita/Zuni Canyon/El Malpais route both ways. Boring, but probably unavoidable. NM 17-19--Unimportant differences in my routes here, roads on ground don't match with roads on map. Climbed Mt. Taylor both ways. NM 15--Nobo took official purple route. Boring and circuitous. Sobo took red road route. Boring. NM 14, 14a--Nobo took the red route. Sobo, took the red route for most of map 14, but cut over on the connector at the south end of the map to the purple route. Dirt road made for easier night hiking. Maybe fewer burrs in socks and got to cross muddy/arroyo river thing on a bridge, but no big deal. NM 13--Sobo took the southern of the two purple routes--water spigot on the red route is dead, so I didn't bother. NM 10--Nobo I took westerly route according to Circle A owner's recommendation. Nice little badlands formation near the southern end of it, less road walking. NM 9--Nobo took purple official route. However, it dies out in the middle of nowhere, so (a) you can't find it sobo, and (b) you'll just have to cut over to HWY 96 eventually. There is no good way, just go. NM 8--The official route on top of Mesa del Camino is in bad shape. Nobo I ended up on the road on top of the mesa and had to randomly cut down the slope, Sobo I ended up on FR468 below the mesa. NM 4--Took the easterly routes here in both directions. It's all roads, just go. NM 2--Nobo I went down to the Rio San Antonio, Sobo I followed the fenceline. No big difference. CO 42--Nobo cut straight down the slope to Alberta Park Reservoir from just west of Railroad Pass, walked out on ski resort gravel road to HWY, walked HWY west one mile to pass. CO 40--Nobo stayed on the literal divide near Knife Edge and Palomino Mountain for less postholing. CO 38--Nobo stayed on the literal divide from near Mount Nebo to Hunchback Pass. early season. Weigh the pros and cons: likely less snow, but a lot sketchier river crossings. Trails Illustrated maps 140 and 141 show the appropriate trails. CO 33--Sobo tried to climb San Luis Peak, got my rear end handed to me by 70mph winds once I got to the ridge between Organ Mountain and San Luis Peak. There's remnants of an old trail from this saddle down to the official trail just east of where the CDT crosses Cochetopa creek. Trail shown on TI map 139. CO 29--Nobo cut from Sargents Mesa down to Sargents via the Big Bend Trail and Marshall Pass Road (dirt). Then walked HWY 50 maybe 12 or 13 miles up to Monarch Pass. Shown on TI map 139, North Side. If you're going to do this, it has to be quicker to drop from further west near Baldy Lake, and you definitely don't have to walk the highway very much--just use CO DeLorme 59 to find some route back to the divide (FR 888 to Hancock Pass, for example). CO 27--Nobo walked HWY 50 down from Monarch Pass past the quarry and into Garfield. Took the dirt road near the snowmobile shop across the street from the lodge, after a couple miles the road becomes the CDT. Saved a lot of postholing. CO 26-25--I didn't go this way, but if it's early season, the snow may be bad from the Alpine Tunnel to the road below Tincup Pass (North Fork Chalk Creek). Avoid it by taking FR295 down from Hancock to St. Elmo, and hang a left on FR 267, which becomes the CDT on its way up to Tincup Pass. This is on CO DeLorme 59. If you do this, you'll pass a cool old mine building hanging on the hill at a funny angle. CO 22--I forded the Twin Lakes inlet in early season, and I'm just a little guy. Did it sobo as well. CO 18-17--Nobo I took the bike path from Copper Mountain to Silverthorne. Sobo I did the red route. I have the feeling that the north facing slope above North Tenmile Creek holds a crapload of snow until pretty late, but it was a very cool route sobo. CO 15-13--Nobo I did the red route via Berthoud Pass, Parry Peak, Rollins Pass, then Devils Thumb Park. Extremely windy. Sobo I made up a route from Devils Thumb Park west using TI map 103. Basically I took FR 128/county 81 down to Winter Park, then walked to Mary Jane ski resort and took the Icarus trail up to the Mount Nystrom Trail and eventually contoured around to Vasquez Pass. The Mount Nystrom trail certainly doesn't exist, but it's all open high country, so it was pretty nice. The road walking and the ski resort stuff sucked though. Sobo I then took the Henderson Spur and walked the Jones Pass road to the pass, which was boring. CO 11--Nobo I did the inland trail at the southern end of Shadow Mountain Lake, sobo I did the shoreline version, which I think is better. CO 10a--Did not do RMNP either way. I shall return. CO 9--Nobo I stayed on literal divide where the trail splits off between Cascade Mountain and Ruby Mountain. It's downhill to Illinois Pass, and I think trail is being constructed in here, but still, it was gnarly and a half. Sobo I did the low route that goes by Bowen Lake, which is pretty. CO 3-2--Nobo I did the Three Island Lake/Beaver Lake route and enjoyed it. Sobo I walked up the road along the Middle Fork Elk River to Slavonia and took the rest of the Gold Creek Lake route. Jim Wolf says there's a large waterfall along this route; I couldn't find it. WY 44--Both directions I walked along FR 550 and 809. There's water in culverts under the road in a couple places. WY 41--This area is totally complicated thanks to two different routes still being partially marked as the official route. I think both directions I took the purple road route at the southern end because there's no tread on the "trail" at that point, then took the red route at the northern end. WY 40-- From Hartt Creek nobo I tried to follow one the jeep roads that cut straight north towards the red "30" on the map. The roads totally don't exist anymore, and it's totally trespassing. Sobo I took what Jim Wolf described as the interim route in this area, but it's still marked on the ground as official CDT. WY39-35--Both directions I walked the road straight into Rawlins. There's 20+ miles of pavement, so it's not that great. WY 34-28--Both directions I walked along the jeep roads to the west of HWY 287. Supposedly this had recently become legal when I did it, but there was nothing on the ground to show that. WY 28a-d--Did the official (non-Ferris Mountains) route both ways. WY 25-24--Nobo did the Sweetwater route from the start to Wilson Bar on map 24. (The horse flies were horrendous, so I left it at Wilson Bar and headed back up to road route). Sobo I did the entire "official" road route. WY23--Nobo I did the purple route south of Willow Creek, sobo I did the northern, red route. I took the "official" cross-country route from the Sweetwater bridge to the road near Atlantic City neither time. WY 22--Red unofficial route nobo, did the unofficial southern purple route sobo. No big difference. WY 20--Nobo I did the route down Rapid Creek, Sobo I went by Clear Lake. WY 19--Nobo went over Texas and Jackass passes. Highly Recommended. Sobo through Fish Creek Park and by V Lake. WY 16--Nobo weather was bad, so I went to the west of Mount Baldy on the Bell Lakes Trail by Chain Lakes and Pole Creek Lakes. Sobo I did the route east of Mount Baldy. WY 15--Nobo I stayed on the purple trail to Island Lake, then followed the outlet down to Fremont Crossing (sort of what Jim Wolf describes, but I'm not sure any real route exists.) Sobo I went over Knapsack Col. The Titcomb Basin is the most beautiful place in the world. WY 14-12--Nobo I did the red route by the Green River Lakes and over Gunsight Pass. From the Lakes, the route is boring all the way to Dubois. Sobo, I got on the high glacier route at Union Pass. You're on a 4WD trail all the way up to the Wilderness Boundary. I came down via Tourist Creek. This route is the greatest thing ever. It's extremely slow boulder hopping, but it's awesome. WY 11--Nobo, I took the red Leeds Creek route. Sobo I started on the purple route, but somehow ended up on the red route where it crosses Leeds Creek. (That's actually what I'd recommend, since it avoids the treadless route up Leeds Creek). WY 10, 10a, 9--Both directions I headed east from Sheridan Pass down the Sheridan Trail (probably the official route), but kept going down and instead of going north I hit the road and walked it north all the way to Brooks Lake. (I was trying to beat PO hours, and the road takes forever to get a hitch on, so you can hike with your thumb out to make progress and try to get a ride to Dubois at the same time.) Sobo I didn't want to do this, but there was a fire blocking the FR 537 route and it seriously took me hours to get a ride, so I did it again. MT 63--From the WY10 maps to here, I did Yellowstone and Mack's Inn exactly like the maps. On MT 63, from just after the switchbacks west of the cool Buffalo bone-hole, I dropped down Pine Creek and hit the road that goes over Bannack (Two Medicine) Pass. It's either FR 951.2 or BLM Road 328. I took that to Road 302, which is a gravel BLM Scenic Byway, and part of the Great Divide bicycle route. I took that up to Morrison Lake and reconnected the CDT there, on the very end of MT 60. MT DeLorme page 20 is helpful. MT 53--I took the cross-country route from before Cowbone Lake, then walked the purple route that stays along the Big Hole River. MT 48--After coming out at Chief Joseph Pass, I walked the road down to Lost Trail Pass, hitched in & out to resupply, then walked the gravel road from near Lost Pass to where it connects to the trail. MT 43--Took the Storm Lake version of the Anaconda Cutoff. MT 31b--It seemed obvious that the Perkins Gulch finish to the Anaconda cutoff was indeed private property, so I went further north on the road to the signed FR 85 that has a public right-of-way. Then I went north towards FR 9411 and Sand Hollow, just south of Orofino Mountain, by the Champion mine, and back to the trail. The Champion mine part is private property, so in that aspect, it's pretty much a wash. MT DeLorme 39 is all you need for this route, but if you have the Beaverhead-Dearlodge National Forest Dearlodge Forest Area Forest Visitor/Travel Map (1996 Revision), then it makes everything super-obvious, and shows that a clearly legal route exists, it just involves a mile or two extra dirt road walking north around the Champion mine property. Another option is to stay on the road up Dry Creek as opposed to breaking away towards Sand Hollow. That's a straightforward public right-of-way all the way to the top at Four Corners. MT 36--From near Delmoe Lake, I stayed on the gravel road 222 to start the "Butte Super Cut-Off." The first map for this is the "Southwest Montana Ineragency Visitor/Travel Map, East Half (1996)," available at many Montana ranger stations or possibly here. Apparently the 1996 maps were revised in 2008. I also used the Gallatin NF map (West Half), the Lee Metcalf Wilderness and West Yellowstone Vicinity map, the Yellowstone Trails Illustrated Map (201), the Yellowstone Lake (305) and Tower/Canyon (305) TI maps that have more detail of Yellowstone, the MT DeLorme, and my father went way above and beyond the call of duty and bought the MT Topo! CD and printed a suggested route through Montana. (Thanks, Dad!) But don't worry, you definitely don't need all of these. I just really like maps. The route is completely covered with just the SW MT Interagency, Gallatin, and Yellowstone maps. Also, I finally got my act together and mapped the route from Delmoe Lake to Yellowstone. Download the 51 meg zip file of 23 jpegs for printing here. View 1, 2 of the maps individually to see what they're like. I like to think that I made this route up, but I didn't come up with the basic idea myself; I have to thank Jim Wolf for that. He sent me a short paragraph with landmarks along the way which I used to string together the first half, and I also received a few helpful suggestions from Ginny and Jim Owen, but I doubt that anybody's done it exactly like I did it, and that's why it was fun. Skittles and Recess did this route in '08 and posted a text description for most of the route on TrailJournals. I crossed HWY 287, walked along the north shore of Ennis Lake, crossed the outlet (the Madison River) and headed north to the trailhead for trail 315. Took 315 up to 413, 413 to 342, and 354 down Mill Creek to road 166. Took road 166 east to the 317 trailhead. (From here on the road is the private property of the Moonlight Ranch, and there is a very large gate just beyond the trailhead. I heard nothing nice about this resort while in town, so I'd try and avoid it. Maps show trail 316 coming down to the road further uphill, but I don't know how you could get to or from that trailhead.) I took trail 317 up the Jack Creek and the South Fork by Lost Lake and Shadow Lake. From 317 to trail 8 by Yellow Mule, to trail 6 down Buck Creek and by Cinnamon Mountain. Walked a mile down HWY 191, then took trail 161, to trail 100 where I entered Yellowstone on the Sky Rim Trail between Tepee and Daly Passes. In Yellowstone: Sky Rim Trail, Crescent Lake High Lake Trail, and Sportsman Lake Trail down to Mammoth Hot Springs. (Resupply available.) Then took the Lava Creek Trail and went down Blacktail Deer Creek to the Yellowstone River Trail through the Black Canyon of the Yellowstone. Up Elk Creek and by Yancey's to Tower Junction (resupply available.) Then walked the Northeast Entrance Road to Yellowstone River Picnic Area (2K7), connected with the Specimen Ridge Trail, took that to the Lamar River, took the Lamar River Trail south to the Mist Creek Trail, took that to the Turbid Lake Trail, that down to Nine Mile Trailhead (5K5), the Thorofare Trail south along Yellowstone Lake. Exited the park near Thorofare Ranger Station via the Hawk's Rest TH (6K5), crossed the Yellowstone (on a bridge, but up this far it'd be doable regardless) and took Atlantic-Pacific Creek Trail up to Two Ocean Pass where I rejoined the CDT. This route is significantly shorter than the official CDT. My estimate is that it saved me 3 days, but it 's possible that it was as many as five. Why did I take such a big short cut? Northbound I was disappointed with both the official route through Yellowstone and the ID/MT border section. Everyone always says that Yellowstone is the greatest place, so I wanted to explore it more, because the official route was so un-praiseworthy. Coming directly from Butte set it up so that I could enter the park wherever I wanted and walk from one end of the park to the other. Basically, I spent 5 full days walking all the way across the northern boundary of the park, and then all the way across the eastern boundary of the park. To be perfectly honest, I still think Yellowstone has nothing on Glacier, the High Sierra, the Winds, or the Grand Canyon, but it was still fun to explore so much of the park. Also, some part of me did want to save time. I was getting more and more concerned about beating Old Man Winter in Colorado, and I was absolutely set on doing every inch of the high route through the San Juans. I don't think this was really the case, but if I had to choose between a week hiking in the San Juans (plus getting to explore a new route through Yellowstone) or a week hiking on the ID/MT border, the choice was obvious. MT 29--Nobo I did the Little Blackfoot River route and thought the densely packed trees were pretty cool. Sobo I did the Thunderbolt mountain route and thought the climb wasn't bad and the views were OK, but Cottonwood Lake was disappointingly vegetation-choked. MT 28--Did the Bryan and Sally Ann Creek route to the east of Jericho mountain both ways. Didn't see a single posted notice or any real evidence of private property. MT 27-26--Both directions I did the 571/1852 route that goes by certain water. It's supremely boring. MT 24--Nobo I dropped off before Stemple Pass down the South Fork of Poorman Creek, met up with the Stemple Pass road and walked the gravel road all the way into Lincoln because I was told I'd have to go all the way to the west of the entire Bob Marshall Wilderness thanks to fires. That wasn't quite true. North of Lincoln I used the Helena NF Map to walk out of town on FR 1800 (Sucker Creek) to FR 330 (Copper Creek) to FR 1882 and the Indian Meadows trailhead. From there I took trail 481, 424, 478, and 438 past Heart Lake, Landers, and Bighorn Creeks. That put me on the western half of the completely asinine bit of official trail that nobody in their right mind would opt to take on MT 20. Sobo I did the standard route on MT 20-24. MT 19--This is where my big fire detour started and ended. 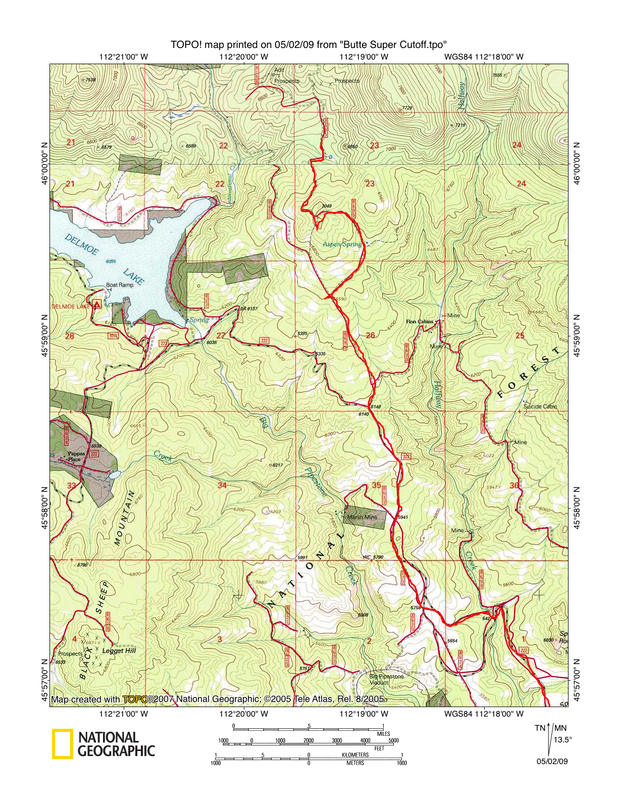 The Bob Marshall, Great Bear, and Scapegoat Wilderness Complex FS map is an absolute must. (They sell it at the Lincoln Ranger Station and at The Base Camp in Helena.) Basically, nobo I stayed east of the trail, and sobo I stayed west of the divide. NOBO, from the Welcome Creek Ranger Station, I went east over Welcome Pass on trail 214, took 244 to Double Falls on the Benchmark Road (235), went east on the road, then north on 258 to Scoutana Ranch, north on road 233 to trail 267 up Lime Gulch, trail 271 down Cutreef Creek and Norwegian Gulch, road 108 west to Blacktail trail 223 north to South Fork Teton trail 168. (Actually, here, the map is labeled differently on the North and South halves. Regardless, I took trail 127 north to road 3307, crossed road 109, and took the unlabeled trail north and then east to Middle Fork Teton trailhead. I walked road 144 north to trail 107 to West Fork Teton trailhead. There I finally got in the Bob, taking 107 north to 105 up past the Swift Reservoir. Then I took 121 and 122 to near Heart Butte, 101 down to Badger Creek, then 172 by Kiyo Crag down to the non-existent Little Badger Ranger Station and the Palookaville trailhead. I walked the road out to the Heart Butte Cutoff Road, which is the road that forms the border of the map. At the very beginning a local told me about a short cutoff, but other than that, I just walked the Reservation road the rest of the way into East Glacier. SOBO, I exited Glacier NP at the Walton Ranger Station, and walked highway 2 to the trailhead for trail 155, which I took up the Middle Fork of the Flathead to trail 166 up Long Creek, then trail 385 down to road 38. Hiked that south past the ranger station to trail 80, which I took all the way to Big Prairie Ranger Station. (From here to Welcome Creek RS was closed for fires, but I was fine. And the ranger I met at Welcome Creek was totally gorgeous, but I digress.) From there I took trail 126 up the Danaher to trail 139 over Observation Pass, then trails 246, 248, and 212 back to the Welcome Creek Ranger Station. From there I did the standard route over Caribou Peak, Lewis & Clark Pass, and Cadotte Pass to Rogers Pass. I took the new route that avoids the asinine bit on Bighorn Creek. MT 7,6--Took the Dawson Pass Route. Highly recommended. MT 4,3--Nobo I took the Piegan Pass, Many Glacier, Swiftcurrent Pass route. I very, very strongly encourage you to take this route, and not the road-walk/Logan Pass/Garden Wall route. Sobo I hiked the Highline Trail past the Garden Wall to Logan Pass, but that's only because I was starting off on my crazy made up partly off-trail route. See below. I did a westerly route through Glacier to set myself up to be west of the Divide in the Bob, since it was on fire. I used only the Glacier/Waterton Lakes Trails Illustrated Map (#215), plus I took a photo of the Glacier climbing book that they sell in all the stores in Glacier so I could know how to do the off-trail Floral Park Traverse by reading the directions off my camera's LCD. I left the official trail at Fifty Mountain campsite and took the Flattop Mountain Trail. (This part isn't necessary, but Flattop campsite is in a burn, so there's plenty of solitude.) I took the Granite Park Trail back up past Granite Park Chalet, the Highline Trail past the Garden Wall to Logan Pass, went up to Hidden Lake Pass, took the trail down to Hidden Lake, and began the Floral Park Traverse--I circled around the west shore of the lake, scrambled up to the top of the ridge, dropped straight down to the tiny Floral Park, climbed up to the foot of Sperry Glacier, crossed the glacier and found Observation Point and got back on trail. Then I went down to Sprague Creek campsite to the Lincoln Lake Trail, then the Lincoln Creek Trail, then the South Boundary Trail. (A lot of the trails on the western half of the park are in crummy shape.) Some old maps show the South Boundary Trail continuing all the way down the border, but it no longer does. I went up the Coal Creek Trail, up and over on the Fielding Creek Trail, then down to the Walton Ranger Station. From here, see my Sobo route through the Bob. MT 1--Halfway done. Turned around at 10AM on August 6 at the border near Waterton Lake.